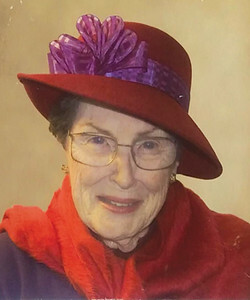 Margaret Alice O’Doherty, the wife of the late Hugh Joseph O’Doherty, Jr., was 94 years old when she peacefully entered the Lord’s embrace in her New Britain, Conn., home, surrounded by her loving family on April 4, 2019. Margaret was an amazingly caring woman who dedicated her life to her family and the service of others. She always made time to help those in need and her home was open to all. She was born on Oct. 25, 1924, in Providence, R.I., to the late William and Ellen Shaw. As a member of Saint Jerome Church, she actively served in the Legion of Mary and Prayer Line and as a Eucharistic minister and choir member. She was also a long-time volunteer for Hospice and the Hospital for Special Care. She thoroughly enjoyed her monthly outings with the Red Hatters and loved to travel, grabbing her hat at any suggestion to go on an adventure. She was employed by Northeast Utilities for over 30 years. Margaret will be dearly missed by all who knew her including her cherished children, Karen Kundra and spouse, Sally Gaski of Kensington, Paul O’Doherty and wife, Wendy of Southington, Mary Marturano and husband, Dennis of Kensington, Peter O’Doherty (deceased), Eileen Fisher and husband, Keith of Corning, N.Y., and Jeanne Marie Pittman; her grandchildren, Shawn O’Doherty (who loving cared for her for many years), Alyssa and Adam Countryman, Jimi Marturano, Jonathan and Megan O’Doherty, John, Joey and James Fisher; her great-grandchildren, Austin, Annie, and Axel Countryman as well as her brother-in-law, and sisters-in-law, many nieces and nephews, and numerous good friends who loved and supported her for many years. In addition to her husband, Hugh, and her son, Peter, Margaret is predeceased by her sister, Isabel, and her two brothers, Arthur, and Alfred Shaw. Visitation will be on Tuesday, April 9, from 4 to 7 p.m. at the funeral home. Funeral services will be held on Wednesday, April 10, at 9:30 a.m. at the New Britain Memorial & Donald D. Sagarino Funeral Home, 444 Farmington Ave., New Britain, followed by a Mass of Christian Burial at 10:30 a.m. at St. Jerome Church, 1010 Slater Road, New Britain, CT. There will be a luncheon at the funeral home reception hall following the mass. Margaret will be buried at a later date. Memorial donations may be made to the American Cancer Society www.cancer.org , Saint Katharine Drexel Parish, (St. Jerome’s) https://osvonlinegiving.com/4578, and the Pro-life Ministry. Please visit this website for directions or to leave an online condolence at www.newbritainsagarino.com . Posted in New Britain Herald, on Friday, 5 April 2019 19:18. Updated: Friday, 5 April 2019 19:21.